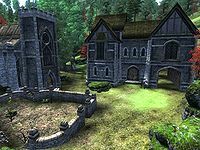 The Priory of the Nine (originally the Abbey of the Eight) is a settlement in the West Weald of Cyrodiil. During the time of the Alliance War, the Abbey of the Eight was a center of worship of the Eight Divines. It was led by an abbess and home to several initiates, along with an order known as the Knights of the Eight. By 2E 582, it was within the territory controlled by the invading Aldmeri Dominion. The settlement was renamed the Priory of the Nine after the apotheosis of Tiber Septim and the creation of the Nine Divines. In 3E 111, it became home to the newly-founded Knights of the Nine, an order led by Sir Amiel Lannus and dedicated to the recovery of the Crusader's Relics. The knights saw many early successes and great fame, but began to dwindle away following the War of the Red Diamond. Sir Amiel, the last of his order, met his fate in 3E 153 while embarking on a final quest to Vanua. The location of the abandoned priory was eventually lost to history. In 3E 433, Umaril the Unfeathered returned to Mundus with an army of Aurorans on a quest to destroy the worship of the Nine. The Divine Crusader, a reincarnation of Pelinal Whitestrake, was led to the priory by the corpse of Sir Amiel. With the guidance of the Nine and the spirits of the old knights, the Divine Crusader recovered all of the Crusader's Relics in order to destroy Umaril. Word soon spread, and the Knights of the Nine were refounded as volunteers flocked to the restored priory. The order ultimately defeated Umaril in Garlas Malatar, and had plans to expand across Tamriel. An Oblivion Gate opened near the priory during the Oblivion Crisis. It is unknown what effect the White-Gold Concordat had on the settlement. In 4E 201, the Crusader's Relics were stolen by a group of bandits from Skyrim and taken to the Reach. They were later reclaimed by the Last Dragonborn.